This week the Supreme Court struck another major blow to common sense and the English language. 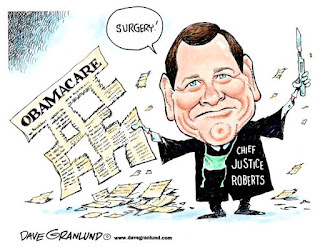 In a ruling upholding the subsidies afforded policies purchased on the federal insurance exchange, the SCOTUS opened a veritable Pandora’s Box of legal interpretation, and expanded power not only of the judiciary, but of the federal government itself. Seven times throughout the Affordable Care Act (ACA) references are made to policies or individuals who are “enrolled in through an Exchange established by the State under section 1311 of the Patient Protection and Affordable Care Act…” In each case, the context is citing policies purchased through insurance exchanges established and operated by the respective states. But the court ruled the actual legal language, and even the context, didn’t matter. What mattered was the “intent” of the congress. So reading “tea leaves” now has greater weight with our legal system than the literal words of legal documents! To be clear, the case was brought to the court on that very issue, whether the literal meaning of the words of the statute were legally binding. The decision was not regarding the efficacy of the ACA, or whether it’s feasible. The decision was on whether the law could be interpreted to support federal subsidies for states with no insurance exchange or only those states that had established their own exchange. The Court has historically ruled on constitutionality of statute. With this decision, however, the Court has clearly become a proactive partner with Nancy Pelosi’s 111th Congress in writing the wholly inappropriately named Affordable Care Act. Seven times the Act described, in context, that subsidies would be available through Section 1311 sanctioned State Exchanges. Yet the Court by a 6-3 majority became a partner in writing the law, ex post facto, by redefining a key component of it. Obviously, legislative intent is now more consequential than legal wording. This means that even legal documents generated by the government, which establish the rule of law by the selection and utilization of specific words and phrases, will not necessarily be judged based on what they actually say, but what the intent was. And since intent can be interpreted far beyond the scope of actual legalese, taking the government to court on any matter of law will now be a potentially arbitrary and spurious crapshoot. To illustrate the absurdity of such a notion, imagine if the same principle applied to our legal documents regarding wills, property ownership, and child custody issues. If the Supreme Court’s logic, or illogic, were to be applied to our legal documents, what they say literally becomes inconsequential, for the intent is what is meaningful, not the words. We can claim that we didn’t intend to break the law when charged, but that doesn’t matter. But if we broke the law, what our intent was becomes inconsequential. Yet now the government claims the plenipotentiary authority to claim intent matters more than the actual law, and the language that created it. A government should never be able to do what an individual citizen can’t. It’s common to take such a cavalier attitude towards what people or organizations say or write. They can say something, and then apologize for it, claiming that wasn’t their intent. But for government, this is a new low. It now has legal precedence to make the same claim with regard to statute and laws, if their intent was different than the actual wording of a law! The omnipotent authority of the government over individual lives is now complete, when words can mean whatever the government chooses to make them mean. Alexander Hamilton, upon the founding of the nation, declared, “It’s not tyranny we desire; it’s a just, limited, federal government.” When government can arbitrarily change, reinterpret, and alter statute, after the fact, it is no longer just, or limited. It is totalitarian and hegemonic! Language is always transmutable. The issue, then, is not what the intent of the word or text is the weightiest component to the meaning of a law is the context of its use. Bill Clinton wasn't a fool to question the meaning of "is" before a grand jury ready to indict him, and in a similar act of self interest, the Supreme Court is not going to deflate the power of the state when they sit high upon it. Larwyn's Linx: Where's the Outrage? Kill the Obama Deal. Before it Kills Us. OBAMA: Burn Down the Suburbs!